We leave Baños by taking a bus for 2.25 $ at 7 pm directed towards Latacunga. After 2 hours, we get off on the Panamericana road (it is famous road because it runs along the Pacific coast of the American continent) and we realize that we are literally in the middle of nowhere. We manage to take a taxi which needs to bring us downtown in order to catch up another bus. But the taxi driver notices that our bus with the sign Zumbahua has already left. So he decides to chase the bus and starts a real race. We still don’t know how he made it, but we get on that bus that goes towards Quilotoa Lake. We pay $ 6 for the taxi and $ 2 for the bus (one hour and a half). But the adventure does not end here: we arrive at Zumbahua at 11 pm and, as usual, we have not booked any hostel yet. And all the hostels here are fully booked. Luckily we meet a nice local man who helps us find a room for the night paid $ 8 per person. It's very cold here and we do not even have water because of a breakdown in the hostel. So we go straight to bed. The next morning, we visit the Quilotoa lake and the view is really amazing. Quilotoa is a lake of volcanic origin, located in the province of Cotopaxi, in the western part of the Ecuadorian Andes. There was an eruption about 800 years ago and gradually the lake was filled with water and over time assumed a colour that became more greenish thanks to the presence of some minerals. We reach this place by a local minibus for 50 cents. It takes about 15-20 minutes and once here we pay an entrance fee of 2 $.Since we don’t have much time available we decide not to walk around the crater but to start a downhill trekking arriving at the foot of the lake. For both trekking is required a good training because the path is characterized by climbs and descents. If you do not make it back, there are donkeys and horses that take you up. Anyway, we climb up again with our strength! For the descent, it takes about 30 minutes while for the ascent about 45 minutes (it depends on your training). Nature has, once again, fascinated us with these incredible landscapes. Despite some obstacles on the way here, we made it and we strongly recommend it! 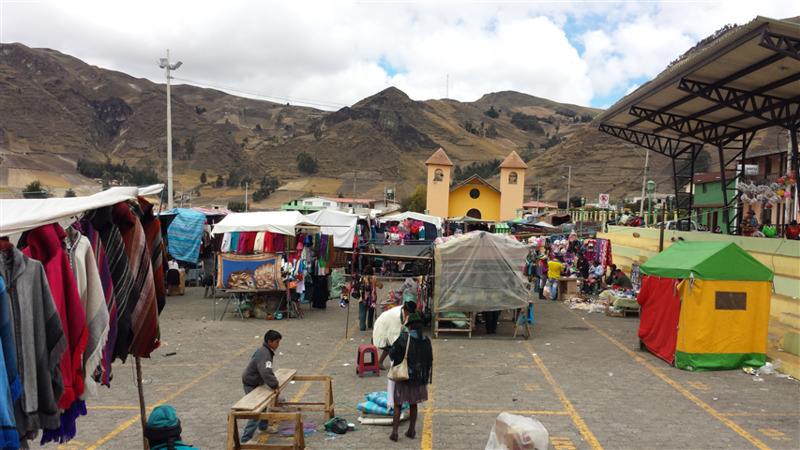 We then return to Zumbahua to visit a local craft market.Here people wake up very early and eat chicken soup for breakfast. We also see many indigenous girls speaking Quechua. Most of them have already few kids, despite the very young age. All these situations make us think about the conditions in which these persons live and we are really grateful for the opportunity of getting to know these realities too.